Food: Fish, frogs, salamanders, lizards, snakes, shrimps, crabs, crayfish, dragonflies, grasshoppers, and many aquatic insects. Habitat: Rivers, lake edges, marshes, saltwater shores, and swamps. The bird usually nests in trees near water. The Great Blue Heron is unlikely to be confused with other wading birds. These stately birds have a slow, methodical pace. The Great Blue Heron is considered one of the most recognizable of American birds. It is the most widely distributed and most commonly sighted among American Herons. It flies with slow, graceful strokes of its powerful broad wings. The most common sight is when the Great Blue Heron stands in a motionless, somewhat dignified position in the shallow waters of a stream, bog or marsh. 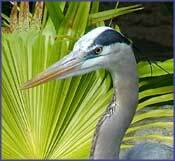 The Great Blue Heron has a blue-gray back, black sides and a gray and white striped belly. They are easily recognized in flight by their 6-foot wingspan and their long neck, which is folded and held in the shape of an "S" while in flight. The great heron call is an aggressive call that sounds like fraank-fraank-fraank-taaaw-taaaw. Hear It Now! Waterfowl cause significant losses to agricultural and aqua cultural crops, damage golf courses, cemeteries, lawns, and gardens, and contaminate reservoirs. Their activities can cause real economic hardship, aggravate nuisance situations, or create human health hazards. Besides consuming fish, herons can injure fish, disrupt their feeding activity, disturb broodstock, and contribute to the spread of diseases and parasites in aquaculture ponds and raceways. Heron feces can degrade water quality and through bacterial activity, lead to reduced oxygen levels. It can result in significant expenditure of time and funds in establishing bird management programs and training personnel. Herons can be difficult to remove. Once established, immediate corrective landscaping and behavioral modification is imperative: Remove cover shrubbery; use herbicides to eliminate aquatic vegetation; and reduce fertilizer, especially around pond area, to make grass less nutritionally attractive. Several visual scare products like Gator Guard and Prowler Owl combined with Bird Stop taste aversion should be employed as soon as the birds enter the area, varying in location and type. For more established flocks, audio scare devices like our top selling GooseBuster which projects true geese distress calls through several speaker locations in a random pattern to scare them away. All systems require constant re-enforcement and should be relocated frequently, especially the Gator Guard replica to remain a realistic threat to the birds. The Industrial Bird Hazer has shown effectiveness at repelling great herons away from large open areas. See our complete list below of recommended bird deterrent products to repel herons. A "synergy" or combination of bird repellent products typically offer the most successful solution for repelling herons. For bird control solutions, we often recommend using companion products by combining electronic sonic repeller devices or bird hazers with visual scare deterrents, physical bird barriers or scent and taste aversion products. This kind of multi-sensory attack is extremely effective in deterring pest herons for good!